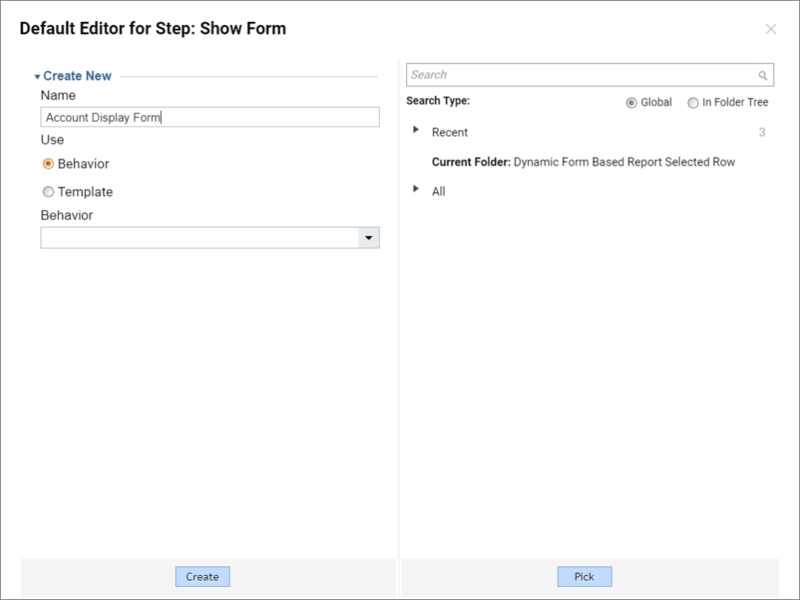 This tutorial demonstrates how to update Form in Flow Run Part	on the Page based on Report Selected row on the same Page . In this example we are going to build a Page in Decisions that has a Report on the left-hand side and a Flow displaying Form on the right-hand side. Form is going to display some information from the Report’s selected row. When user selects different row, our Form should be updated with the new information from selected row. For this example we created a simple Accounts Report. To learn how to build your first Report, please click here . First and most important thing to make Report row selection update Flow on the same Page is that one of the Report columns has to ‘Send Data As Filter Change Source’. In a Report Designer	we pick one of the columns and Edit	it. 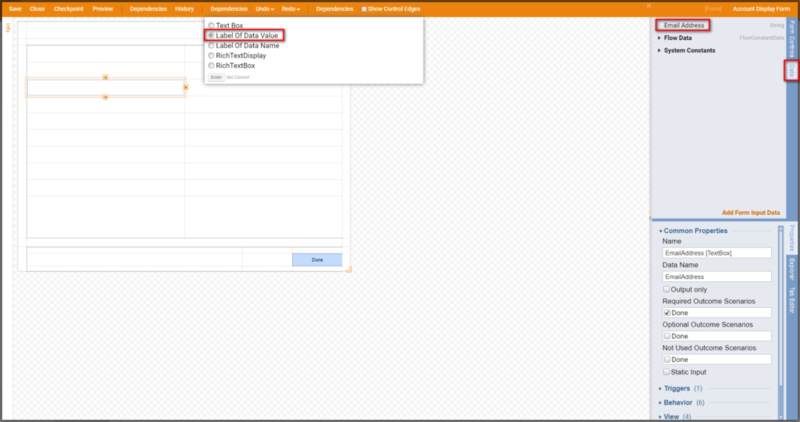 Then, we locate and check Send Data As Filter Change Source	check-box. In Filter Change Source Name	we provide a Name	for our Data	. Click Ok	to save and continue. Note:	this Name should be exactly the same as our Flow Input Data name later in this tutorial. This completes our Report settings. We can save Report and close Report Designer. 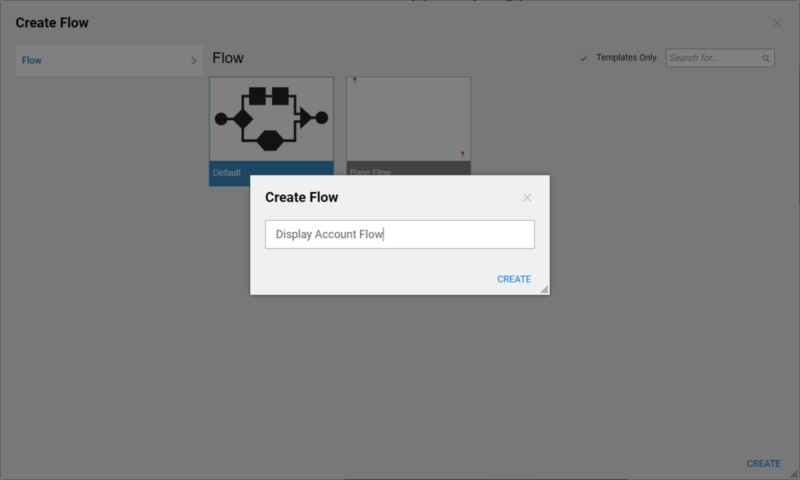 Next, we are going to create a Flow to display Form . In the Designer Folder	we click Create Flow	on theActions Panel. As mentioned previously in this tutorial, our Flow has to have a Flow Input	named the same as we named Filter Change Source	in Report . 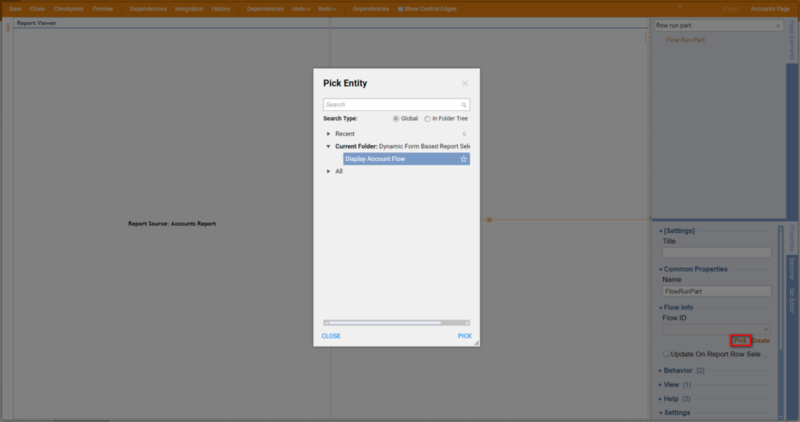 We selectStart Step	in our Flow , locate Flow Input Data	settings, and click Show Editor. 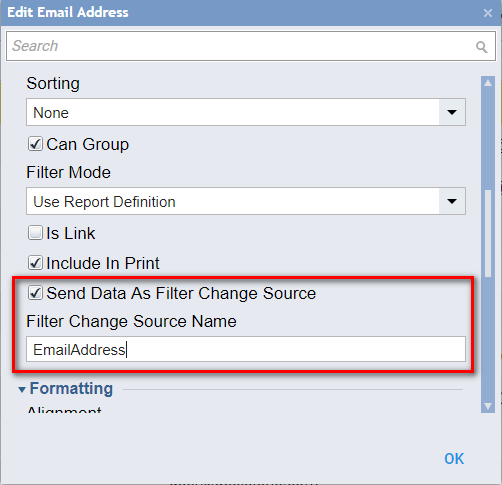 In Data Definitions	window we name our data exactly as we named Filter Change Source	in Report	(EmailAddress) . Then, Close	this window to save and continue. 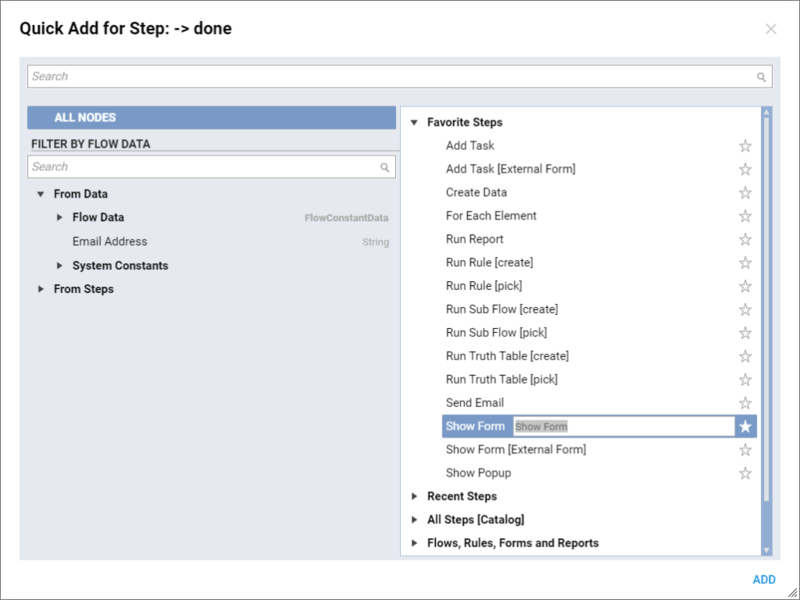 Next, we add Show Form	step from Favorite Steps	category. 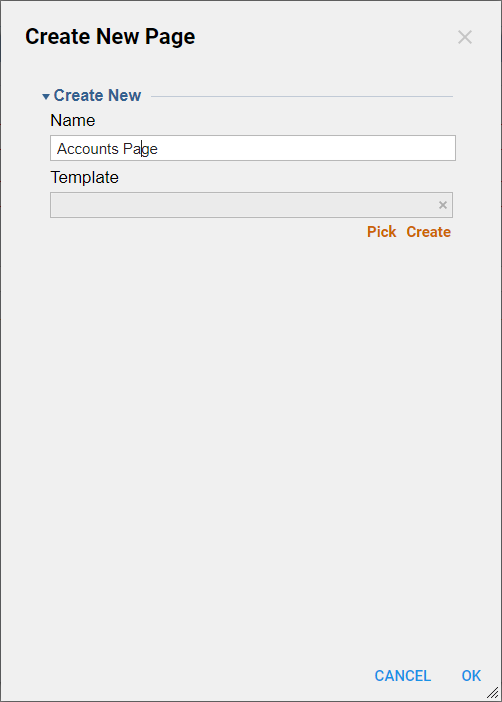 In the resulting window we Name	the Form and click Create	to proceed to the Form Designer. Our Form is designed as following… It has a Button	control and Email Address Label Of Data Value	to display Email Address from the selected row on the Report . When finished designing Form we can save it and close Form Designer. Back in the Flow Designer we connect the outcome from our Form Step	to the End Step	. This completes our Flow . We can save the Flow and close Flow Designer. Finally, we are going to create a Page	and put all pieces together. 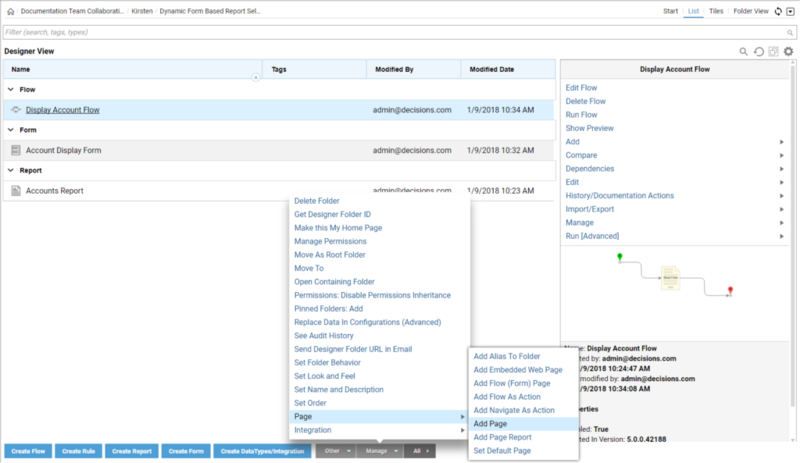 In the Designer Folder	we click Manage >	Page > Add Page	on the Folder Actions Panel. In the Page Designer we add Report Viewer	to the left-hand side of our Page and pick Accounts Report	as a Default Report. 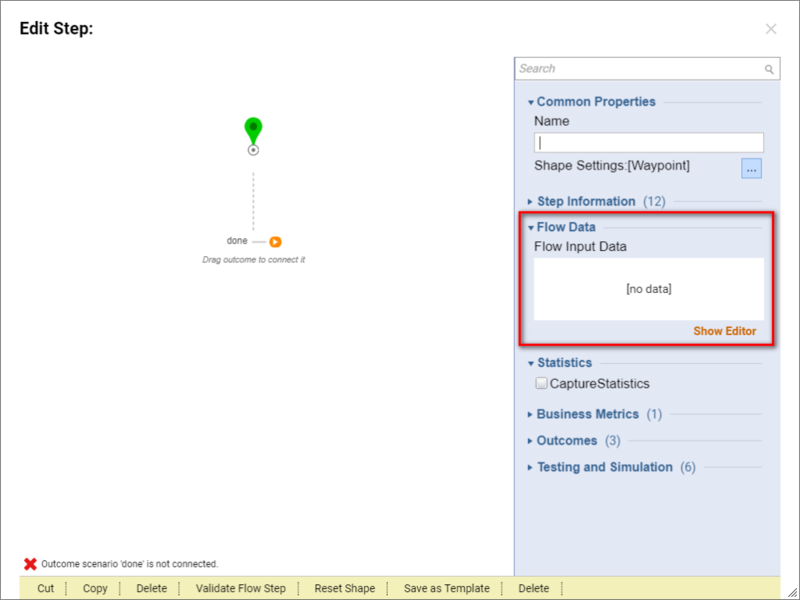 Next, we add Flow Run Part	component to the right-hand side of our Page . For the Flow Run Part we locate Flow ID	setting and using Entity Picker pick our Flow	. 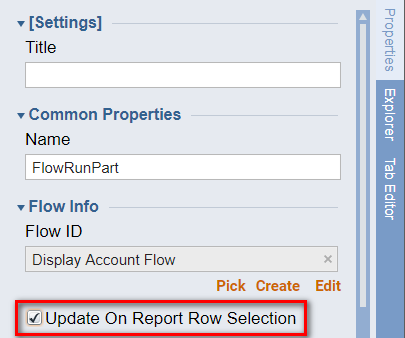 Finally, we check Update On Report Row Selection	check-box option for Flow Run Part component. This completes our Page . We can save the Page and close Page Designer. Our Accounts Page	view looks as following… First row on Report is selected by default and our Form displays respective Email Address. 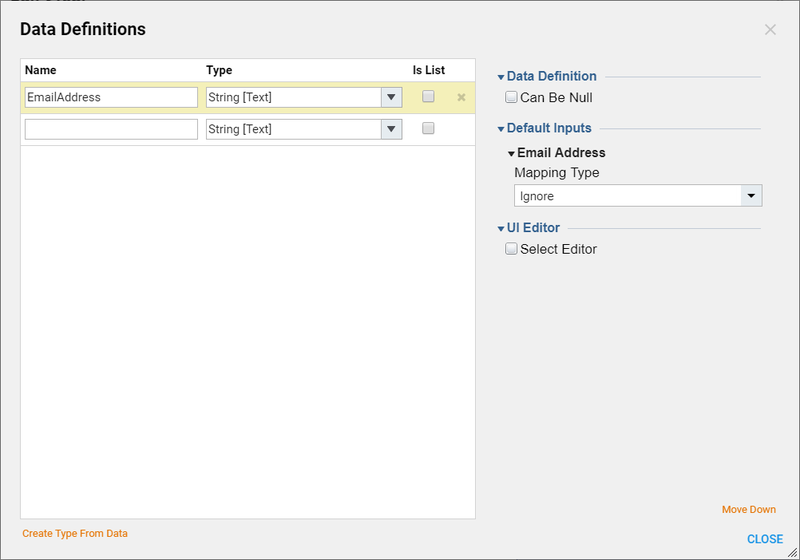 When we select different row on the Report , Flow automatically reruns and displays newEmail Address on the Form .